Hello NOAA? We have a problem! ..it's the same problem we've had all along. Looks exactly like so many years past. Private Boats north of Cape Hatteras in 2016 - All Mid-Atlantic & North Atlantic Private Boats Caught More Sea Bass--4,247,354 Pounds--than every Trawler/Trapper/Partyboat/Charter Boat - All Combined = 2,833,111 Pounds. All 2016 For-Hire plus the average of the last ten years annual Commercial catch north of Cape Hatteras becomes dwarfed next to Private Boat catch. Your "Best Available Scientific Information" asserts small, privately owned boats, used by a fraction of recreational fishers, caught nearly twice as many sea bass as every commercial & professional recreational fisher--all combined. Our regulatory troubles comes when, instead of saying "Oh, that's codswallop," NOAA simply grinds every bit of bad data through their catch-restriction only based restoration system. There is no filter to trap the bad..
What an astounding amount of biological & economic waste loyalty to these statistical catch estimates has created..
Monty Hawkins here, a party boat skipper from Ocean City, MD. that specializes in reef/wreck fishing. Doing just that 37 years now. I work on fisheries restorations all the time. A gargantuan task with thousands of players, I prefer to focus on the biological & ecological aspects of our restoration efforts. Our federal fisheries management system is primarily centered on catch restriction. Managers have told me their task is not restoration, but management. This seems to belie "Rebuilding Target" seen so often in their work, but it is what I've been told. Managers, these Council Members & Commissioners--everyone at NOAA, they are forever & perpetually busy with recreational regulation despite incredibly many other fisheries. I've long held recreational catch data's use creates an incurable curse upon management. So many years gone by & to this day; catch estimate data's terrible affects on the management community's rational conclusion/action/regulation owes only to NOAA's staunch: "It's the best scientific information available." No matter everyone's sincere desire to create good & fair regulation --often incredible effort from individual players & in every administration--and no matter who the appointees are-- recreational catch estimates gum this important effort up terribly. There is no way, at least not that I've found, to make this a fun read. Bad Catch Data is how we're being robbed though. Promise. I've written about recreational catch estimates many times. Been looking at them since 1998/99 when I was forced to take unnecessary risks with clients owing a two week cbass closure in August. That regulation stemmed entirely from a bogus NJ For-Hire statistical catch estimate. Maryland was the only state to follow the Fed's closure guidance. Other states rightly ignored it, having not been published in the Federal Register in time. MRFSS = Marine Recreational Fishing Statistics Survey - fishers say MuRFSS, most managers say MurFiss..
VTR = Vessel Trip Report - a NOAA federal form in quadruplicate, loaded with catch info, that MUST be submitted to NOAA for each & every fishing trip. Any error or failure to fill in required boxes results in a return to the permittee for correction. Back to that early closure, my first run-in with bad catch data; in that early regulatory period, the late 1990s/early 2000s, For-Hire fishers had proof, or close to it, the Marine Recreational Fishing Statistics Survey was badly wrong -- and we were writing Congress. My Congressman, Wayne Gilchrest, chaired House Fisheries back then and knew baloney when he saw it. We Party/Charter sea bass guys could show MuRFSS was inflating For-Hire estimates--exaggerating them many-fold. That's because NOAA requires professional recreational fishers to submit a "VTR" daily. A Vessel Trip Report ..and boy does NOAA get nasty quick if you fail to send them in. Recreational catch estimates are basically split into Shore - Private Boat - and For-Hire. A repair was made to MuRFSS in 2003 that began to give more & more 'catching power' to Private Boats, while also lowering, continuously, For-Hire catches. For instance, this year, again, Maryland currently shows ZERO sea bass caught by Party Boats. Though this "preliminary" number will likely change in the year to come, (and this particular estimate has no true bearing on regulation,) the fact remains regulations are already decided long before any correction occurs. I tell NOAA every single trip a nearly precise number of sea bass my clients caught in these VTRs we Party/Charter skippers fill out daily. It's a fair-many sea bass--Not Zero. This MRIP table shows every Maryland party boat threw all their sea bass back. I promise - many a client's kitchen smelled of fresh sea bass cooking. Or, sometimes, their sea bass were served ice cold with wasabi & soy.. Delicious. PRELIMINARY 2016 BLACK SEA BASS 10,522 25.3 0 . Even though we surrender catch data on VTR sheets daily, NOAA.gov says we tossed all our sea bass back. In 2015 they did the same thing. On one 2015 fall trip I'd invited a bunch of policy wonks who were in town anyway for an Ocean Policy meeting. A senior NOAA administrator (yes, he bought a ticket) and some family caught sea bass every drop. Some were keepers. NOAA's MRIP catch estimates then said we'd caught 56 pounds of sea bass all year -- and none of those aboard a Party Boat. That estimate left my upper-echelon NOAA.gov paycheck recipient--this very successful angler who truly enjoyed his fresh fish--scratching his head..
Our troubles are not in under-estimates however. It's in Private Boat over-estimates. Yes, sometimes a shore estimate can catch a statistical moon-shot too. Here's a table showing all NJ Shore Tautog Landings in early spring. Missing in this table are 2011, 2014, & 2015.. These years would also be a zero as shown in 2016. In 2010 the old MuRFSS estimating program had shown 73,000 tog caught & boxed on New Jersey's jetties that March & April. I had railed against the estimate - it was nuts. Two years later the new & improved MRIP estimate took that screw-up, one of the most blatant errors in my findings, and raised it up 100,000 fish. I knew our troubles were far from over in the New & Improved MRIP.. PRELIMINARY 2016 MARCH/APRIL TAUTOG 0 . 0 . New Jersey's Jetty Anglers were catching tog like crazy while tog ain't biting? (though they sure might this year, warm as it's been) Freezing their butts while sitting atop 5 gallon buckets, they caught more computer-tog than all U.S. commercial effort for the entire year. They also caught more tog than all U.S. Party/Charter for the year too. A neat trick only achievable with statistics - it remains in the data. Another: You'll remember Maryland has zero Party Boat sea bass in 2016. Here's MD shore sea bass..
12.5 inch sea bass from MD's jetties? It's a dern wonder I can sell a ticket at all. In the official MRIP data all my clients were cbass-skunked, while shore anglers had to buy more freezers..
NOAA's worries with an occasional crazy Shore estimate, or with a Party/Charter spike, are not what cause our troubles. It's the continuous increase in Private Boat. Today, even after MRFSS's Congressionally mandated replacement with the MRIP program, & even after two supposedly hard looks from the National Academy of Sciences; it's rare to find a set of Private Boat estimates that make sense. 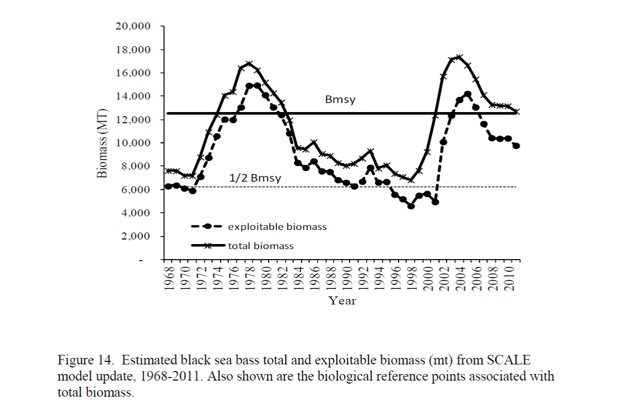 Since 2009 our new and supposedly "improved" rec catch estimates from the Marine Recreational Information Program, MRIP, have portrayed recreational sea bass catch as wildly out of control ..despite far and away the most draconian regulation in the fishery's history. For instance: Recreational Private Boat fishers in New York, in 2016, are said to have caught 1,846,000 pounds of sea bass. Not the whole coast's Private Boats - just New York. Management truly fears this powerful force & has factually reacted to it in regulation. It was only hard fighting at Council/Commission that prevented a further restriction in sea bass regs this year. Then New York's Private Boats, catching when most Private Boats boats had long since been put away until next spring; NY's recreational Private Boats even caught 718,000 pounds of sea bass from just after Halloween to New Year's Eve in 2016. To put that 1,846,122 pounds of Private Boat sea bass catch by one state's Private Boats in perspective: the 10 year average for all Commercial Trawl & Trap from Cape Hatteras to the Canadian border is 1,612,000 pounds.. (They do not publish commercial data w/o a year's delay, but 1.6 million is going to be pretty close.) Therefore NY's private boats outcaught commercial fishers from North Carolina to Maine by 234,000 pounds. Why do we become concerned when we see pictures of thousands & thousands of pounds in one tow by a trawler? It's obvious, in NOAA's "best" data that small private boats are the real problem.. Going back to MuRFSS's early estimates; from 1981 to 1990 Party/Charter Boats north of Hatteras landed an average of 6.4 million sea bass-- 6.4 million individual fish, not pounds. That's all pre-regulation catch. Though also fuzzy as heck, we could--and did--try to catch every sea bass possible. In the MRIP estimates from 2007 to 2016, however, we For-Hire skippers and our clients landed 0.58 million sea bass - a precipitous drop of 5,820,000 individual fish per year that are not being caught by For-Hire. Regulation ought surely curtail our catch -- and indeed it has. In the Private Boat side of catch estimates though, we see an altogether different result. From 1981 to 1990 Private Boats from Hatteras north are said to have landed 1.6 million sea bass annually - as an average number of fish. The average from 2007 to 2016 in Private Boat catch is only marginally lower at 1.2 million sea bass. Their average annual catch has only declined by 400,000 individual fish.. In For-Hire we see regulation take it's toll on catch--where Catch Restriction is doing what it should and everyone who paid to go fishing on a daily rate sees their catch fall & feels it like a sharp knife; yet the average from 2007 to 2016 in Private Boat catch is only marginally lower at 1.2 million sea bass..
Lower, but not lower like their sea bass catch should be.. Still, even these averages are as nothing in our troubles. It's big spikes in the data that cause our real regulatory pain. In 2016, for instance, Private Boats north of Cape Hatteras, (belonging to those citizens fortunate enough to have a boat with offshore capability; some time off from work; & inclined to go after sea bass instead of trolling for tuna/marlin/blues/striper, or drifting for fluke) - those fortunate few anglers "caught" more sea bass than all commercial trawl/trap & party/charter combined. All 2016 For-Hire & the average annual Commercial catch = 2,833,111 Pounds. Ummm? Hello? NOAA? Is anyone home? Yup. That makes Grady Whites & Boston Whalers almost twice as deadly as Party/Charter/Trap/Trawl all combined.. I somehow doubt any fisherman would agree with that assessment. Yet it is the exact "Best Available Scientific Data" NOAA will use--is using--to keep our sea bass fishery restricted with the tightest regulations ever ..even though the latest cbass population assessment, a stock assessment thought better than any they've ever had before, a population assessment showing sea bass at 2.5 times their intended restoration target. And regulation will not loosen because of MRIP's private boat landings statistical estimates. Bad data makes for bad regulation. I've been trying to get NOAA interested in essential reef habitat--even coral habitat--off DelMarVa since 2000. Trying to show NOAA & everyone in the science community how size limits affect sea bass reproduction since 2006 or so. Trying to show them their catch estimates are nuts--just dumb crazy, since 1998 or so. No joy. Nope. Not yet. Trying to show them we can build all the coral reef we want just by rolling rocks off a barge - and build anywhere we want if we use enough. Fifty fathoms, five fathoms - a hundred fathoms. It all works. I want NOAA to know any real increase in habitat necessarily increases fish populations. I want NOAA to know whether we're building intentional restoration of reef lost in the early industrial commercial fisheries (which has never happened yet in the ocean,) or some small bit of reef building funded by a raffle & bake sale (what I do mostly) -- some progress is better than no progress. Instead of seeing other methods of restoration in our young endeavor--any other means to focus on aside from catch restriction in marine fisheries restoration; NOAA is forever chasing their tail, forever finding overfishing by Private Boats as big & wicked as any by foreign trawlers of yore -- the early industrial period before the Magnuson Act in 1976 when US trawlers were FREQUENTLY outnumbered by foreign boats - big ones..
Overfishing, these days, is always ---ALWAYS--- by private boats with a few anglers aboard enjoying their day.. I am certain a simple method of testing MRIP's veracity can be fashioned from "Percentage of VTR Catch." Say a collection of NY skippers assert the only time Private Boats catch even 50% of that state's sea bass is on Saturday in summer. Other summer days it's more like 30% - and in late fall not even 5%.. This would have to be looked into deeply - but it can be checked. Were Private Boat percentages of VTR-reported catch exceeded by, or undershot, then closer examination would be warranted. Here is an actual table from NY containing VTR (Vessel Trip Report) landings. You can plainly see how MRIP varies widely from reported landings. NY Sea Bass Catch June to December From NY Fisheries -- VTR is self-surrendered data. MRIP's Party & Charter estimates, however, would be grossly undershot and in need of correction. If we applied 10% to this year's Wave 6 estimate, we'd anticipate a Private Boat catch somewhere around 17,000 pounds. Instead, there is regulatory turmoil because it's nearly 3/4 of a million pounds. We might also consider species effort. Also in NY & points north, there is considerable effort on scup. Any For-Hire deckhand could approximate the ratio of sea bass to scup. Lets say it's 15 to 1 scup -- that any regular angler would catch 1 sea bass to 15 scup. Here NOAA sees a nearly 50/50 split in the sea bass/scup fishery. It's the same, but incredibly higher, for Private Boats. Is that right? I doubt it, but certainly don't know. NOAA could hammer it into an accurate test by interviewing many participants. Be a lot cheaper than lots & lots of new dockside intercepts/interviews with anglers. Our troubles are amplified this year like few others. In a quadruple whammy, RI, CT, NY, & MA all have very high private boat estimates this year. Each is vastly higher than their state's commercial landings. All but Rhode Island's are also higher than the average North Atlantic commercial trawl/trap annual landings - some substantially. MRIP's Private Boat estimates.. That's why we're forever over-quota & cannot enjoy our sea bass restoration. Nor can managers, locked into using bad data, explore for means to achieve better result in a real restoration..
Every port has guys on the water who have a feel for what's being caught. It's what we do. This "Percentage of VTR Catch" would never be the estimate - it's just a test to see if MRIP is in the right solar system. Here are NY & NJ's For-Hire/Private Boat numbers in tables I've adapted. If For-Hire fishers with any sense of it might think NY's Private Boats catch 40 to 60 percent of their state's sea bass, the For-Hire "Percentage of VTR Catch" would surely shoot a flare quickly at these wild divergences. Virtually every time these separations grow too broad, there's big trouble in sea bass regulation.. In case you've not had enough, below is a piece I wrote a few years back. Maybe come back to it later? A Short Regulatory History of the Recreational Sea Bass Fishery ..
NOAA is, absolutely, positively, stealing our fisheries with bad data. This really needs fixing or we'll never move on to what is truly important in marine fisheries restorations. With the permission & blessing of the Nichols Family, I began self-regulation on sea bass & tautog in 1992 aboard the party boat O.C. Princess, Ocean City, MD. For sea bass, a nine inch size limit was chosen because I'd been told by a biologist, "All sea bass have spawned by 9 inches, some twice." Within months I knew regulation was going to work, that we could undo the damage done by industrial overfishing. Sea bass fishing became better - Instantly. 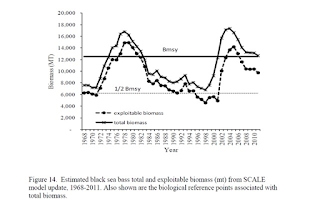 By August, 1992, we could see healed hook wounds from Kahle (wide-gap) hooks in numerous sea bass from nearshore reefs, especially reefs less-known or unknown to others. Fish Do Not Fall From The Sky. We must learn how to make fish. Guided Skillfully By Management, Fishing Pressure CREATES Surplus Production. Sadly, right now management's enveloped in an enormous smoke-screen of bad estimates. I believe history will recognize this period as precisely how NOT to manage a fishery. ..now to do it on purpose.